This plugin allows for efficient and effective communication between teachers and administrative staff during traditional grade reporting times at the end of the term. After grades have been stored at a specified deadline, office staff enable grade verifications for the teacher portal. 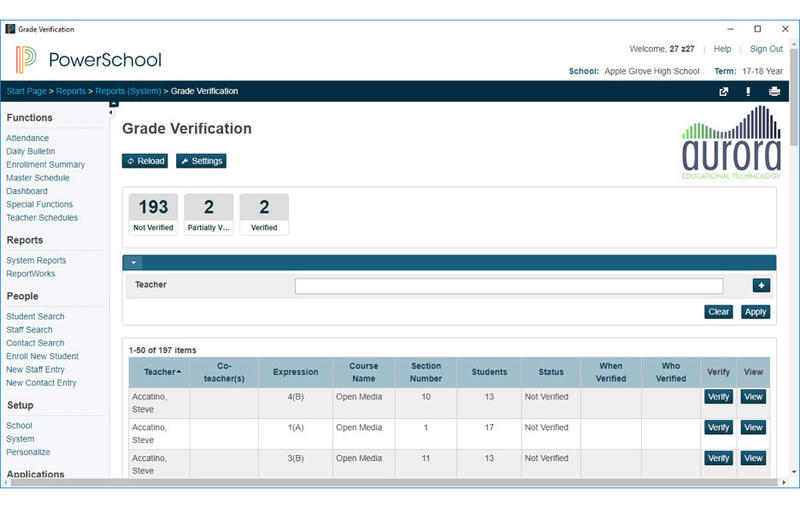 Teachers are notified in the PowerTeacher portal that they have grades that must be verified. Clicking the link displays a grid of scores with students, storecodes, and grades. Teachers review the grades as they will be reported on report cards and click the Verify button to mark all grades as having been verified. If a grade needs to be changed, the teacher first makes the modification in the gradebook (PTG or PTP). The verification process not only marks a grade as verified, but it also updates the grade in the storedgrades table with the new grade, percent, comment, GPA points, GPA added value, and credits earned. This ensures that the gradebook and storedgrades are in sync when parent reporting term grades are calculated and stored. If grades need to be changed after verification, office staff can unverify a single grade or an entire section so a teacher can reverify and update the grades with the new data from the gradebook. This ensures that office staff are aware that there is a problem and that report cards need to be held or reprinted. A user-friendly dashboard shows staff which sections have been verified and which teachers need reminders. This dashboard features tiles, a searchable grid widget, and quick access to a section’s scores. Administrative staff can even verify grades for teachers who are not available or for classes that have not been assigned a real teacher.